80 mm x 150 mm with a 0.25 inch bleed. Note: If printed from Adobe Acrobrat or Reader with "fit to page" selected, this one makes a nice flyer, too. It scales well. Note: Remember to check postal regulations for postcards. According to Canada Post, the max dimensions of a "postcard" are 235 mm x 120 mm. According to the US Postal Service, the max dimensions are 6" long x 4.25" high and 0.016" thick. Also, the double-zero in 2001 on the first line in the red area got blanked out on the printed postcard but we couldn't track why. Black and white layout. We printed it on red and a bit heavier paper. It is designed to write four passes double-sided on one letter sized sheet of paper. The included script numbers each pass and lets you generate the rquired number of passes. See the readme file in the zip archievefor details. Template for the ICSE conference slides, e.g. 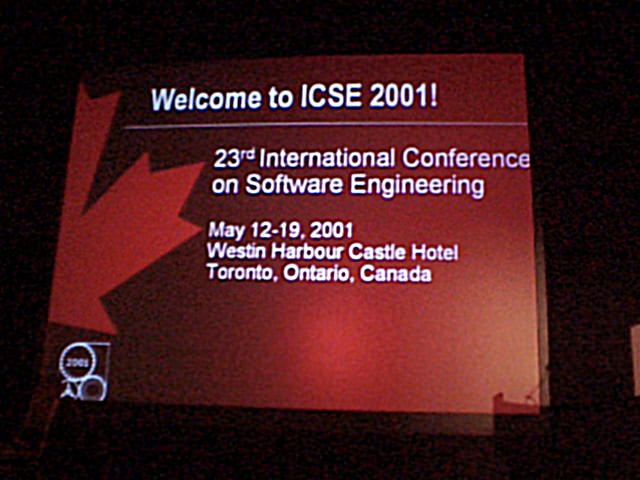 used at opening, closing, award session. Design for the welcome banner placed on the stage. 24 feet wide (from left to rigth) and 5 feet high (top to bottom), Illustrator 9.0 format on a transparent background. Note: The material for the banner was black, the white and colored fonts were cut out and placed on it according to the design. Due to the internal Illustrator page size limit, we could only produce smaller files, so the Illustrator file is 18 feet x 5 feet. They centered the file, so that there was an equal black border of 3 feet on the rigth and the left respectively. Note: the poster is huge and needs some time loading. There are two tif pictures in the background. If you extract exhibit.zip, there should be a folder "exhibits" and "poster". 54 inch x 24 inch, and a pdf file "exhibits.pdf" for viewing only. In "posters": 4 poster, 36 inch x 24 inch a pdf file "poster.pdf" for viewing only.